The San Francisco Map Fair will take place in the Lodge at the Regency Center, 1290 Sutter Street, in San Francisco, California. The San Francisco Map Fair is sponsored by the History in Your Hands Foundation (HIYHF), a non-profit organization with a mission to provide classrooms with authentic, historical objects in an effort to help foster a more enriched learning experience. For more information about the History in Your Hands Foundation, visit our website at www.hiyhf.org. 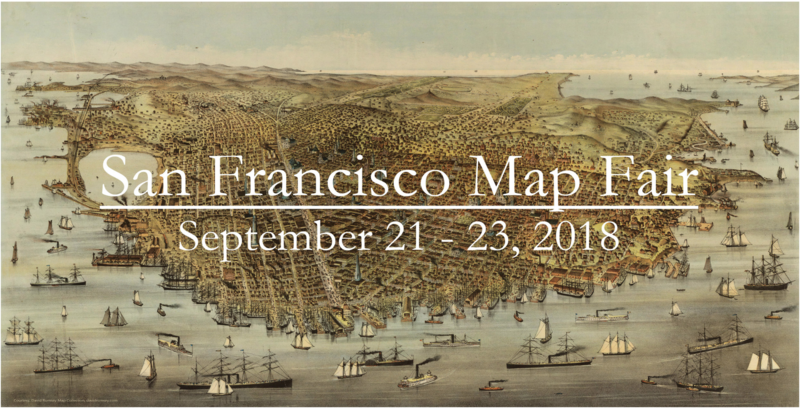 The lecture series portion of the San Francisco Map Fair will be sponsored by the California Map Society. It will consist of three 40 minute lectures followed by a 10-minute Q & A period. The mission of the California Map Society to preserve and disseminate historical and contemporary cartography, primarily of California, for members as well as the public. The society was formed as a statewide association in 1978 and incorporated as a California non-profit public benefit corporation in 1987. If you love old maps this is a wonderful opportunity. Here is a link to the show website.